This year’s presidential campaign has had some surprising twists and downright disheartening results for Republicans and Democrats alike. Anyone else feeling slightly depressed by the choice of candidates left standing? Don’t be. Not because there aren’t more than a few causes for concern, but because there is one thing that will never change despite whoever lives in the White House. To quote the sixteenth-century German Reformer Martin Luther, who himself lived in dismal days of spiritual darkness, “God’s truth abideth still.” When you’ve lost sight of hope, remember this. Nothing can change that fact. No candidate, no catastrophe. Nothing. In light of the seemingly bleak days looming over us, particularly when considering the future of your children and grandchildren, it’s easy to succumb to fear or paranoia. But is this the biblical response to calamity and chaos? Believers all throughout history have endured persecution, wars, and natural disasters, yet without losing hope in our faithful God. If men such as Job can choose to praise God “though he slay me,” surely by God’s grace we can as well. Our God is a mighty fortress. A fortress depicts a picture of strength, protection, and permanence. Just as a tower is a safe haven for those in distress, so, too, is our God. When we abide under the shadow of the Almighty, we have nothing to fear (Ps. 46:1–2, 91:1). Our God will never fail us. The spiritual battle around us is real. Though we live in a sin-filled world ruled by the prince of darkness, we can find hope in God our helper, for He has promised to be with us (Zeph. 3:17; Heb. 13:5–6; Deut. 31:8). Our God is on our side. Those in Christ Jesus are kept safe in the Father’s hand by the Spirit. Nothing can separate us from the love of God (John 10:28–30; Rom. 8:31–39). Our God is unchanging and never ending. We can rest safely in Him, knowing He will never become unloving or unrighteous, for the Lord of Hosts (“Lord Sabaoth”) is the same yesterday, today, and forever (Heb. 13:8; Ps. 102:12–17). Our God has already won the battle over sin and death. It may appear at times that darkness has overcome the light. But as children of God we can cling to the hope that is in Christ Jesus who conquered sin and death through the cross and resurrection (Ps. 118:6; John 1:1–18). Our God has granted us every spiritual blessing in Christ Jesus. In our own strength, we can do nothing; but armed with love and filled with the Spirit, by faith we can move mountains, stand against the devil, and run the race set before us (John 15:4–5; Eph. 1:3–6, 6:10–18; Heb. 12:1–3). Our God is the Sovereign Ruler of an eternal kingdom. The things of this world—our achievements, possessions, status, etc.—will all fade away, amounting to nothing. But God’s kingdom will never end. Trust the God who knows the future, and invest your energy in the things that will last (Matt. 6:33; John 18:33–37; 1 Peter 1:22–25). Perhaps you have other weighty, more personal things on your mind than a presidential election. No matter what your burden may be, in times when everything is spinning wildly out of control, leaving you feeling inept and powerless, remember that there is an all-powerful God who still sits on His throne. He will never leave you or forsake you, and in Him lies the strength to respond in faith to whatever may come your way . . . today, tomorrow, or ten years from now. Choose to shift your focus from the chaos and fix your eyes on Christ. Choose to trust God with your future (plus that of your children and grandchildren, too). Choose to push the mute button when unnecessary criticism escapes your lips, and instead voice your concerns to the Lord in private prayer. Choose to give thanks for all things, in all things. Clearly we are in a great time of need in our country, but all is not lost. Nineteenth-century author E.M. Bounds once observed, “Every mighty move of the Spirit of God has had its source in the prayer chamber.” Do you believe that? Do you believe there’s still hope for whatever trials may lie ahead? Turn to the God of hope in prayer, not despair, and cling to the promise of Psalm 34:17 that He will hear us when we cry out to Him. 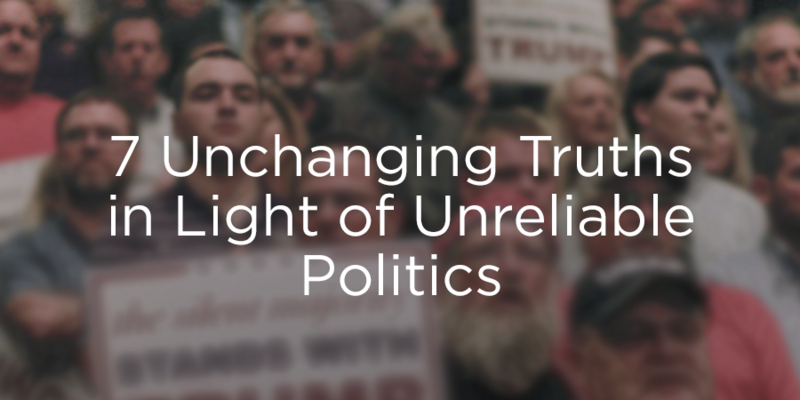 7 Unchanging Truths in Light of Unreliable Politics originally appeared on TrueWoman.com.